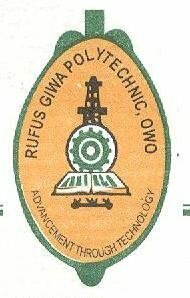 Rufus Giwa Poly Admission List – The lists of candidates offered provisional admission into the Rufus Giwa Polytechnic, Owo (RUGIPO) National Diploma (ND) and Higher National Diploma (HND) Full-time/Part-Time programmes for the 2018/2019 academic session have been released. The management of the Rufus Giwa Polytechnic, Owo (RUGIPO) has released the names of candidates offered provisional admission into its various full-time/part-time ND and HND programmes for the 2018/2019 academic session. Candidates that applied for Rufus Giwa Polytechnic (RUGIPO) ND and HND admission can now start to check their admission status online. Check Rufus Giwa Polytechnic Admission List. [*]Go to Rufus Giwa Polytechnic admission status checking portal at http://rugipo.edu.ng/Default.aspx . [*]Locate the ‘Admission Status‘ column and supply your JAMB Registration Number/Application Number in the required column. [*]Finally, click on ‘Check Status’ to access your RUGIPO admission status. Congratulations to all the candidates that made it to Rufus Giwa Polytechnic admission list for the 2018/2019 academic session.